Showtime's Nurse Jackie already has received just what the doctor ordered -- a second season pickup. Monday's premiere episode and its same-night encore drew almost 1.5 million viewers, which is big stuff for Showtime. The premium pay cable network then acted fast, announcing a 12-episode renewal just two days later. Edie Falco, already a TV immortal as Carmela Soprano on HBO's The Sopranos, stars as a pill-popping, blunt-spoken nurse whose patience is mostly bestowed on her patients. ***Another animated series is rising from the dead. Futurama, from Simpsons creator Matt Groening, will return with 26 new episodes under a deal with Comedy Central. It originally aired on Fox, which made the show part of its past six seasons ago. Comedy Central, which owns the rights to 72 earlier Futurama episodes, says it will begin showing the new ones in mid-2010. Family Guy, also canceled by Fox, has enjoyed an ongoing second life on the same network. Both series' rebirths are largely due to robust DVD sales. 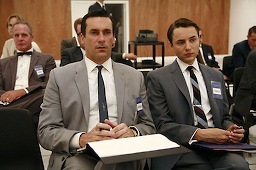 ***AMC has a day and date for the third season premiere of Mad Men. It's Sunday, August 16th at 9 p.m. (central). The complete Season 1 of the acclaimed series currently is available to viewers with "On Demand" cable capabilities. Season 2 will hit the On Demand circuit on July 20th.